The most joyful emanation produced by a colony of bees is known as the "song of increase"--declaring that the hive is flourishing and the bees are happy in its abundance. Song of Increase takes us inside the world of the honeybee to glean the wisdom of these fascinating creatures with whom humanity has shared a sacred bond for millennia. Within these pages is a bee-centric approach to living with honeybees, rather than advice for simply maximizing the products they provide. Jacqueline Freeman takes us beyond traditional beekeeping and offers a way to work in harmony with honeybees for both their good and ours. "Our way is one of kind observation," she explains, "where we create supportive homes and fields for bees to live in, as well as tend the heartfelt relationships we form by being together." Song of Increase focuses on hidden aspects of apiculture that lead us naturally to more sustainable practices. Freeman illuminates the unity consciousness that guides every action in the colony and how this profound awareness can influence the way we see both the natural world and ourselves. 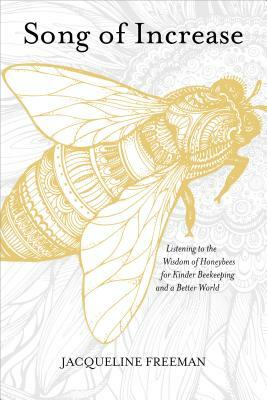 Each chapter presents a wealth of information about the life of bees, including Freeman's personal insights and direct teachings received from the bees themselves. Jacqueline FreemanJacqueline Freeman is a biodynamic farmer and natural beekeeper who speaks at national events including the Organic Beekeepers Conference, Women in Agriculture, and permaculture and nature conferences. She lives in Washington state. For more, visit spiritbee.com. Susan Chernak McElroySusan Chernak McElroy is the author of the national bestselling book Animals as Teachers and Healers; and Animals as Guides for the Soul. Diagnosed with terminal cancer in 1987, she survived - by following the dignified, joyful example of her dog Keesha, who had died ten years earlier of the same type of cancer.McElroy and her husband live in Oregon, where they share their farm with miniature donkeys, llamas, chickens, geese, cats, dogs, and a cockatoo.